A report detailing the methods and findings of a social inclusion study. Since most individuals with intellectual and/or developmental disabilities live at home, engaging families in social inclusion helps build more inclusive communities. This project was exploratory, mixed methods research about supporting families in how to expand social inclusion for their adult children who were living at home. Whether the adult child had a mild or more severe degree of disability, the study found that families can successfully use the same strategies that human services agency staff use to expand social inclusion for group home residents. Families discovered the openness and willingness of community members to include and befriend their children. The project also helped family members see their children's gifts and possible relationships with the larger community. 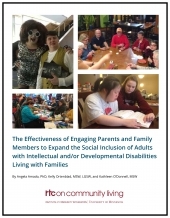 Besides the challenges of connecting individuals with disabilities with other community members, the study's main challenges were measuring and tracking social relationships, family recruitment, and type of project structure. Similarities and differences found between training families and agency staff may also be useful for those engaged in training families in future endeavors. Many families expressed a deep need for different types of social inclusion projects and efforts.